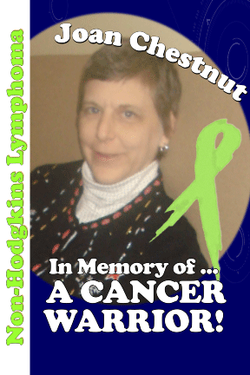 Joan Chestnut was diagnosed with Non-Hodgkin’s Lymphoma while undergoing her yearly GYN exam. She kept up a brave face and went through chemotherapy several times (her hair would come back a different color and texture after each treatment! ), the cancer continued to pop up in different parts of her body. The last place was her kidney. She functioned on one kidney for two years, then found out it was in her other kidney. Throughout the five years, she maintained a positive attitude and continued to put on a brave face while struggling with her cancer battle. She participated in a cancer clinical trial in the beginning of her battle. She was so appreciative of the nurses and physicians that cared for her, especially her great oncologist here at Hershey who kept her going for the five years. Her only wish was to live long enough to see both of her kids graduate from high school, unfortunately she passed away and was not able to see either of them graduate. With her great upbringing, they are both doing well (both in college). Every year on Christmas Eve (her favorite time of year), we go to her grave and have a toast to one great person who we sorely miss!